One of the essential baby items that you have to secure is the diaper changing pad. 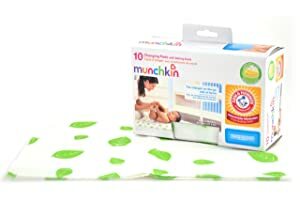 Every time your baby needs a quick diaper change whenever you are out of your home, a pad should be there not just to make the diaper change easy, but to keep the baby protected as well from dirty surfaces. As you realize its worth, you are probably thinking of buying one the soonest. It is best that you look at the different diaper changing pads first before you make your purchase. 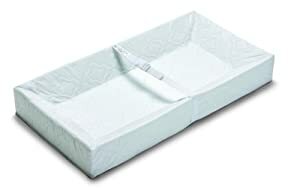 A diaper pad in mini mattress style fits for the baby and is designed for use on a specific table for baby. Like a mattress, it needs a fabric cover to prevent leak from staining the mattress. It is also easier to keep the mattress clean. When traveling, you will need a changing pad if you bring your baby along. For this purpose, it should be lightweight and easy to carry. It is also foldable and can be stored in a bag when traveling. A diaper changing kit looks like a bag with extra room for the diapers, wipes, and other small essential items in changing diapers. It is also foldable and portable in any of your short trips or travels. This type of pad is designed to be disposed after use. You do not have to clean the mess after use because it is disposable. It is also a travel-friendly pad because it will not occupy much of the space in the diaper bag, and it can be folded to fit in the bag for short or long trips. The baby tends to wiggle a lot even during diaper change, which is why you have to decide whether you choose a curved one or a flat one. The curve will be helpful in keeping the baby in the center of the pad. Some pads have safety belts. If you do the changing by yourself, you will need this belt to ensure that the baby will stay in the center and not fall. Pads should be cleansed every now and then. Choose one that is easy to clean depending on your preference of cleaning. Waterproof surface – The surface of a waterproof diaper pad can be easy to clean. A simple wiping may do to prevent spills from soaking into the pad. Diaper pad cover – A washable cover is like a bed or mattress sheet. After use, you can easily put them in a washing tub for washing. You will need several sets of the diaper pad covers to always have one available anytime. 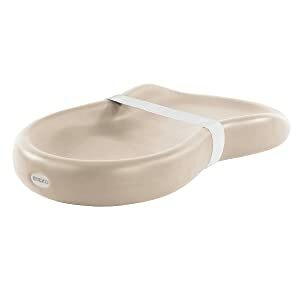 Some pads slide over the table, and this is not a good option, especially if your baby wiggles a lot. Check the underside whether it slides or slips easily on the table. Check whether the pad fits your table. Some pads are too large in size and may not fit the table you have at home. Featuring four full contoured sides or edges, this pad keeps your baby safe and secure in its place during diaper change. The safety strap is also helpful, and so does the double layers. It is easy to clean and carry, making it a great choice at an affordable price. 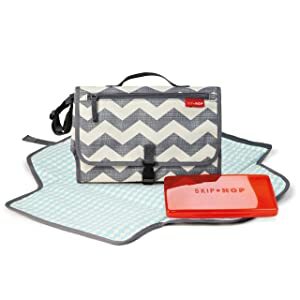 This diaper changing pad is best for travel because it has pockets for the essential accessories in changing diapers. Each pocket is designed with zipper for closure, and the mesh pockets can hold 4 diapers. Its foldable design forms a small pouch bag, with a clip that you can simply attach to a stroller or place in the diaper bag. Its colors and designs resemble a peanut and is a great shape for a baby diaper changing pad. It looks hard, yet it is soft to touch, making it a child-friendly item to have. It also has edges that serve as the contour to keep the baby in its proper place during changing time. Although it is expensive, it is a great item to have for its sleek design and fashionable color, as well as for its function. This large diaper changing pad is foldable and portable. It is a handy solution to your baby’s diaper changing time even when you are on travel. 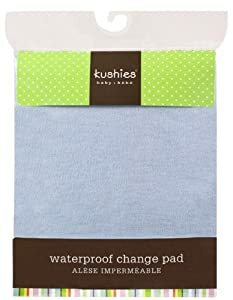 It can be washable and drier-friendly as well, which is a great feature to look for in a changing pad. 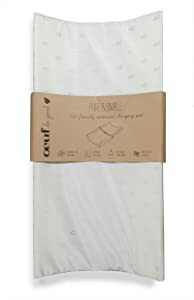 For parents who are conscious of the materials for the diaper changing pad, this one is a great option because of its materials used. The fiberboard is from a plant based material, and its surface contains no chemical and toxic substance that may irritate the skin of the baby. What is best about it is that it can be screwed to the table for safety and security of the baby. A lovely feature about these disposable diaper pads is that they have in built odor protection. The pad actually helps neutralize the smell of diaper spillage. A lovely feature if you are not near a trash can and have to return the soiled diaper changing pad to your diaper bag until later.